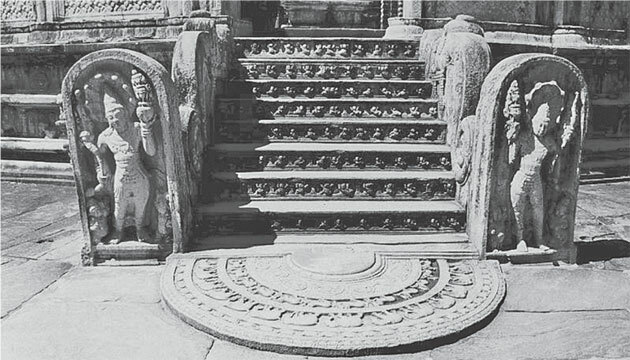 Ancient Sri Lankan artists took particular care to add unique embellishments to the entrance of religious buildings or palaces so that it conveyed a broader meaning. By this, the artist presumably intended to heighten the attractiveness of the place and to convey a deeper message or a truth. The entrance to the ancient buildings especially included elegantly sculptured Koravak Gala, a flight of stairs, the guardstone and the moonstone an excellent piece of sculpture ever to have been produced by the Sri Lankan artist. The traditional entrance to any edifice or religious building is characterised by twin guardstones that stand on either side of the moonstone (Sandakada Pahana) and in front of the Koravak Gala. The visitors to the place catch a glimpse of the guardstone that stand before them inspiring a certain mysterious awe and respect. The guardstone is a stone slab that is curved at the top and is generally called Mura Gala by archaeologists. Though the guardstone originally carried a plain surface, it subsequently came to be decorated with different symbols, figures, and carvings. In the initial stage, the guardstone was a mere stone slab and was meant to be starting point for the Koravak Gala (the dragon's figure). The guardstones at Wessagiriya, Mihintale and Somawathi Chaithya are the best examples for the initial plain guardstone. In the next stage of development, the guardstone emerged as a major work of art with its own identity. During this phase of development, the guardstone had the figure of coconut flowers on a pot (Pun Kalasa) which is considered the sole symbol of prosperity from ancient times. The Buddhist culture strongly claims that the full pot is the mark of fertility, wealth and prosperity. Therefore, the artist has duly infused the concept of prosperity into the guardstone and thereby ascribed prosperity to the particular place. It is however, to be inferred that there was a practice of keeping a big ground pot of coconut flavers on either side of the main entrance to an important building. Later, the artist may have carved out the figure on the gaurdstones to symbolise the solemnity, prosperity and depth of the place the visitor is entering. The guardstones with the pot of coconut flowers are found in Isurumuniya and Welgam Vihara of Periyam Kulama. Here the sculptor has been excessively careful to project the minute details of the coconut flowers and the artistic shape of the pot holding them. D.T. Devendra is of the view that the guardstones depicting the figure of pot of coconut flowers (found in Tissamaharama) belongs to the first century AD. On another guardstone, the Pun Kalasa has been carved out to stand on a lotus. Therefore, the scholars and archaeologists such as D.T. Devendra and Dr. Charles Godakumbure stress that the Pun Kalasa (Pot of coconut flowers) has been specially introduced by the artist to signify prosperity, wealth and a fertility. The Sri Lankan guardstone reflects centuries of development. The sculptor has been successful in carving out figures of gods or sentry on guardstones. Some legends connected with the temples say that some figures carved were so realistic that the people entering the temples stood transfixed at the real-life figures of handsome men on guardstones. In this phase of development, we see that the sculptor has introduced figures of Bahiravas (dwarfs) and figures of Yakshas. The gaurdstone depicts two dwarfs, the servants of 'Kuvera' who is considered the god of wealth. According to the epics written by Kalidasa, the two dwarfs (who are the bodyguards of Kuvera) were called 'Sanka' and 'Padma'. The dwarfs were believed to safeguard the wealth and the place and were the sole protectors of everything entrusted to them. In literature, the dwarfs are described to be the protectors of the earth, especially the guardians of a treasure kept by a king. They are further described as a group of Yakshas who are to be satisfied by animal sacrifices. They are characterised by a pot belly, brawny, heavy-set limbs, and a bold head with piercing eyes showing resolution protecting their charge. The dwarfs on the guardstones are seen wearing ear-rings, a necklace and a thick thread across their bellies. Dr. Charles Godakumbura concludes that the shaft held by them might be a chain of coins. From 200 AD up to the end of Anuradhapura epoch, the Sri Lankan sculptor has exploited the figure of dwarf for his architectural works. The best archetype for the guardstone with dwarfs is that found in Tholuvila and its is datable to at least seventh century AD. The dwarf on the guardstone found in the palace of King Wijayabahu in Anuradhapura, is represented in a highly artistic style. The half-closed lips express a smile and the pendular earrings, the thread that runs across the neck and the belly, the bracelets are all carved in a realistic way. The hands of the two dwarfs rest on their belies and they are holding a chain of coins. Most of the guardstones represent the dwarfs as extraordinarily short and strong. Thus, he guardstone brings to light a strong belief in ancient Sri Lanka that the Bhairavas (dwarfs) protected wealth and treasure stored in any place in their charge. Commenting on the group of Bahiravas illustrated in the Thivanka Pilimage of Polonnaruwa, H.C.P. Bell says. "These small men smiling in extreme happiness are packing along the foundation of the Pilimage. They seem to number at least two hundred and fifty. They are playing, eating and are engaged in all types of merry-making. I think nowhere are people more playful than these small men and women...."
We see that the figure of Naga (Cobra) is beginning to dominate the guardstone after the tradition of carving dwarf figures. In the first stage, the figure of cobra with a series of hoods was carved along with dwarfs. The replacement of dwarfs with the figures of Naga (Cobra) on guardstones was the indirect outcome of the influences of Nagas as a major tribe in early history of Sri Lanka. However, the figure of Cobra was a sacred symbol in Buddhist culture in Sri Lanka. The guardstones found in Minneriya and Mihintale feature figures of cobra with many hoods. The most advanced phase in the development of the guardstone is the sculptured sentry with a cobra in his hands. The handsome sentry is holding a cobra in his hands and is wearing a crown-like things decorated throughout. He is giving his full weight to his right foot and there is a lot of rhythm in his poise. The dwarfs who were the dominant figures in the first guardstones are now at the foot of the figure of the sentry (probably a prince). The Pun Kalasa now rests on his right hand. The Naga Sentry is a matchless artistic creation by Sri Lankan sculptor.